Linda Forrest has crafted these collections of simple arrangements to create a fun and "wacky" educational experience for elementary students. 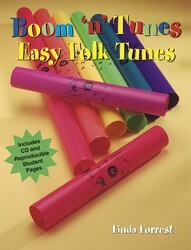 Contains reproducible pages for classroom use and an accompaniment CD. Song List: Johnny Works with One Hammer, Rocky Mountain, Scrapin' Up the Sand, L'il Liza Jane, Skip to My Lou, She'll Be Comin' Round the Mountain, Bim Bom, Old Dan Tucker, Polly Wolly Doodle.